I was nominated by Tista Ray for the Super Sweet Blog Award. Thank you, Tista! This award is a great way to discover new blogs. So, let’s share it around and have some fun with it. 1. Thank and link to the Blogger who nominated you. 3. 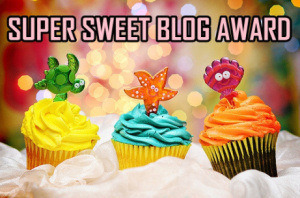 Include the super sweet blogging award in your post. 5. Notify your super sweet nominees. I don't eat cookies and cakes anymore as I'm on a gluten free diet. I suppose I still love cake more, especially chocolate and carrot cake but without the dreaded gluten. Lots of different things: ice-cream and chocolate sauce and chocolate mousse, and a firm favourite is sago pudding. We have a ritual of pudding every Friday night. That's our treat night. I crave sweet things pretty often though. Don't really have a sweet nickname but one that's used by my hubby is "Leen." No obligation to take part but have fun if you do. Thank you for the nomination, Kathy. I've got a pretty sweet tooth, too. I was so hoping you would nominate me. I love sweet things. Thanks Kathy. AHHHhhh...how did you know? All my teeth are sweet...Thank you so much for the nomination, Kathy!!! I'll post as soon as I get back from vacation! !